Sand Spa is a modern spa experience to fit the everyday needs of any person. No locker rooms, no showers, just high-quality services. We offer individualized services tailored to each client’s specific needs. We take pride in creating an unmatched customer experience. Our front desk is here to ensure that your every need is cared for in a professional and relaxed manner. Our skilled massage therapists, estheticians, and nail technicians are all licensed and highly practiced in their respective fields. Sand Spa has unparalleled standards in spa hygiene and sanitation; we guarantee that our client’s health and safety are our highest priority. Sand Spa recently curated a nail division, Polish Nail Boutique as a sister company to the brand as well as a hotel division to the ever-evolving Sand Spa repertoire. 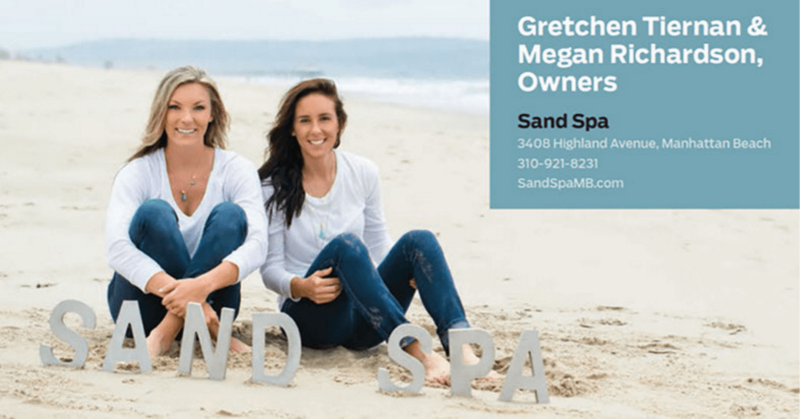 Sand Spa Manhattan Beach is currently offering massage services, skincare, and waxing. Sand Spa with Polish Nail Boutique in Hermosa Beach is our first ever One Stop Spa ™ that offers a full service nail salon, massages, waxing, and eyelash extensions. Sand Spa at The Beach House Hotel offers massage and skincare services to the guests of the 110-room hotel. Polish by Sand Spa in Manhattan Beach will be our first stand-alone full-service nail salon. With plans for expansion, it is our mission to create more accessible, affordable luxury day spas. We started Sand Spa because we knew firsthand the many benefits of massage treatments. As collegiate basketball players, we used massage regularly to treat ailments, improve mobility and prolong the longevity of our playing careers. We found that massage not only made our bodies feel better physically, we experienced how it helped us manage stress, get a better night’s sleep and improve our overall mental well-being. As athletes, we had access to regular massage treatments. In the real world, lavish, expensive, and sometimes-lengthy spa visits aren’t ideal for anybody dealing with life’s day-to- day challenges. We set out to create a place for the everyday person to experience high quality spa services at affordable prices on a more frequent basis. We believe a trip to the spa shouldn’t happen once a year; it should be apart of your lifestyle. Self care is essential in feeling empowered and enlightened. Self care starts here. Cash tips only for all service providers. NO TIPS on credit card. Women that are pregnant must be out of their first trimester in order to receive a body treatment. The only massage service that can be performed on them is a prenatal massage.